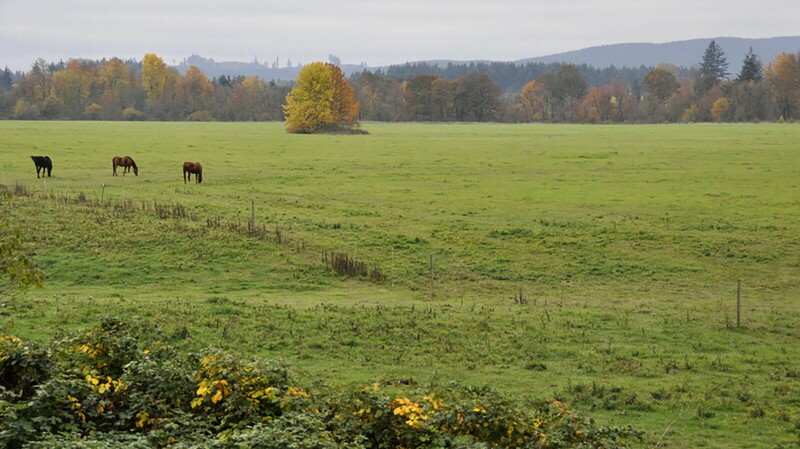 91 acres located outside Rochester, along the Black River, in southwestern Thurston County. The Holm Farm has about 1 mile of riverbank along the salmon-bearing Black River, as well as highly diverse riparian zones, pasture land, and a managed woodlot. The riparian area along the Black River provides habitat for black-tailed deer, beavers, coyote, raccoon, golden-crowned kinglets, red-tail hawk, kingfisher, northern flicker, and band-tailed pigeon. The dark waters that give the Black River its name rise from springs near Black Lake, and flow south in a languid retracing of the torrent that raged from the last ice age glacier. Fourteen miles downstream the river curls in a great oxbow, slipping past the shadows of a tangled bank of Oregon ash and red osier, cascara and wild rose. This curving mile of water shapes 91-acre Holm Farm – a blend of wild habitat and carefully stewarded farmland. Pete Holm and Margaret Rader grew up on the farm – land that their grandparents bought in the 1920s and their parents worked as a dairy. Later years have brought this brother and sister back to the land, along with a desire to see it protected for future generations. In addition to donating a conservation easement to Capitol Land Trust, they are working with the Natural Resources Conservation Service to enlarge the buffer of riparian forest along the river. Thousands of trees are being planted, and a new fence will protect riparian areas while assuring continued agricultural use of pastured land. Summer water temperatures in the river sometimes exceed recommended levels, and Margaret notes that shade from their riparian trees plays an important role in improving water quality in the river. Along the wet, wild edges of the riverbank, mink, otter, muskrat, and beaver go about the business of hunting and foraging, and the work of raising their young. Salmon spawn in the gentle riffles of the river, while herons stalk the shallows and kingfishers hunt from perches above the water. Wood ducks and mallards dabble for aquatic insects. The Black River has garnered attention in recent years as one of the most important wildlife habitats in the state, supporting a wide variety of migratory birds and fish. Capitol Land Trust is working in partnership with the U.S. Fish and Wildlife Service, The Nature Conservancy, Washington Department of Fish and Wildlife and Thurston County to identify, purchase and develop significant habitat preserves within this extraordinary ecosystem. Through the conservation easement with the Capitol Land Trust, Holm Farm becomes an important piece in the mosaic of protected lands along the Black River.